The SlimVideo framework works off modules, each of which are easy to move around and make your website look the best it can. The Touch Drag and Drop Builder for making web design simple for just about anyone, no matter what the experience level. Along with video support, the modules provide assistance for sidebars, contact forms, call to actions, grid, list, mosaic, timeline or other post view options. Also, you can add your content in columns, making it very easy to create your loved layout option. 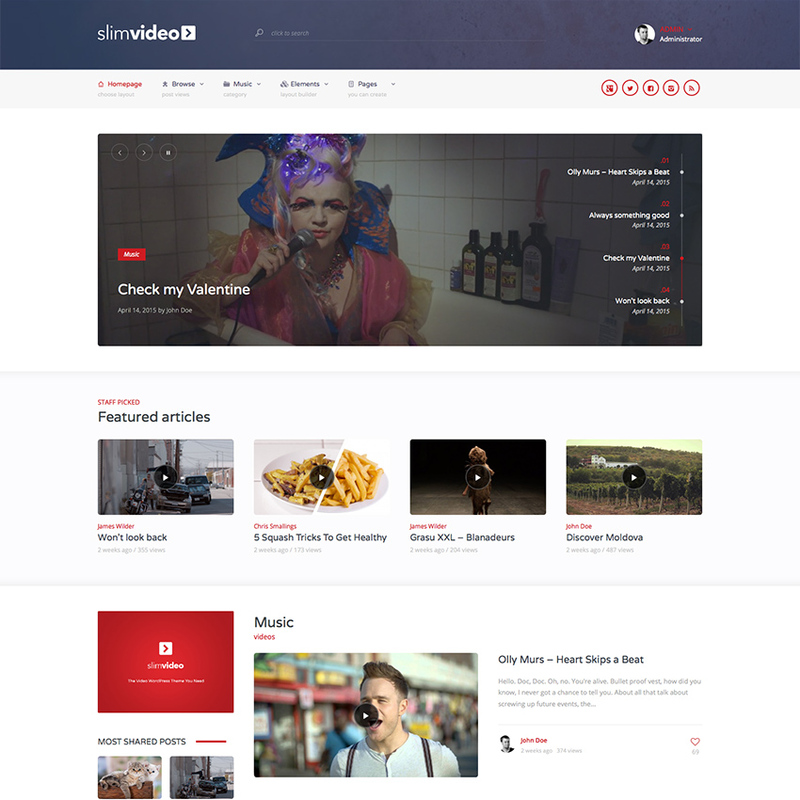 Also, this beautiful WordPress Premium Theme comes with 4 different single video styles, giving the administrator the option to choose which he wants for any video anyone uploads or adds on the website. This WP Video WordPress theme also comes with a built-in like system, it’s very easy to use and offers tons and tons of possibilities. You can also choose from infinite layouts and colors, which is a nice advantage for those looking to create a unique branding strategy. Frontend submissions are available, making your website into more of a community, not having only the possibility for just a video presentation site. Choose from over 60 elements to make the ultimate customization atmosphere. The mega menu is a standout feature, considering you can make it so that hundreds of menu elements are available to guide your customers to the proper products or videos. Along with custom widgets and seven article views, this responsive theme is one of the top choices for you when trying to share your best video content. YouTube, DailyMotion and Vimeo are supported and ensure you don’t have any problems with the most popular video upload services. Ad space is offered in case you want to try to monetize your website, and the slider offers an area for placing videos, descriptions and buttons. Also, this stylish WordPress Video WordPress Theme comes with 4 built-in sliders, even with the beautiful Stream Slider, which is a unique feature, since it’s built only for this premium product. Also, you have the option to add pre-roll and count the views and clicks for your banner in a very simple and intuitive management system.